There will be a new name on the high street this summer with the arrival of Japanese brand Mitsuoka in the UK. It may not be familiar over here but Mitsuoka is well known in Japan for producing classically styled British-inspired cars based on mundane saloons and hatchbacks. In fact, Mitsuoka has been producing hand-built cars in Japan since the late 1960s and it's this era which seems to inspire most of its models. These include the quirky Viewt - an oddly shaped small saloon designed to look like a Mk2 Jaguar but actually based on a Nissan Micra and the Ryugi - a mish mash of classic Rolls Royce and Bentley styling that is in fact based on a hybrid Toyota Corolla saloon. Sadly we won't be getting those in the UK but there will be the Mitsuoka Roadster - a Morgan inspired open-top that's based on the Mazda MX-5. It will go on sale in June 2015 courtesy of TW White & Sons, a dealer based in the south of England that also sells Mazda, Hyundai, Kia and Suzuki. 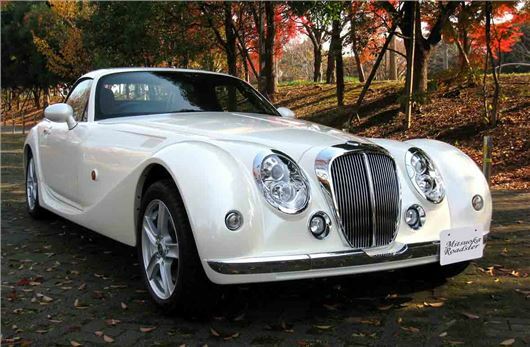 Mitsuoka says it features the world's fastest retracting hard top which takes just 12 seconds to open or close. It also comes with heated leather seats, automatic climate control, Bluetooth, cruise control and 17-inch alloys. It's far from cheap though with an eye-watering list price of £53,800 for both the manual and automatic, while metallic or pearlescent paint is an extra £620. While it has plenty of intrigue it will certainly be interesting to see how many they sell in the UK - and to whom. The dealership certainly sounds confident though. "We share in the philosophy and passion of Susumu Mitsuoka and genuinely believe that the Mitsuoka Roadster can make a real impression on those that want exclusive luxury - albeit at a very competitive price," said Jen White, Mitsuoka Project Manager for TW White & Sons.